While there are better bikes in the world, the allure of riding these old Russian machines was a clincher for me and I must say, Minsks are great fun! When travelling, I feel it’s important to come away with an understanding of the land, and our guides provided an invaluable insight into the history and culture of Vietnam as well as a taste of everyday life in the North. I cannot praise them both highly enough and for providing a safe, thoroughly enjoyable ride and I’ve left feeling I’d made some good friends. An unexpected bonus were the others who rode and I couldn’t have wished for a more diverse and friendly trio to share the experience with. 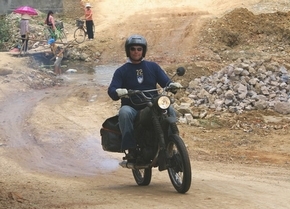 All in all, I have and continue to recommend Explore Indochina to all those still listening….I plan to get back soon!